Dentures offer many benefits to those who no longer have the use of their natural teeth. They help restore the ability to eat a greater variety of foods and encourage clearer speech. Once you’ve made the switch from your own teeth to dentures, whether partial or complete, you will also be pleased to have your smile fully restored at last. 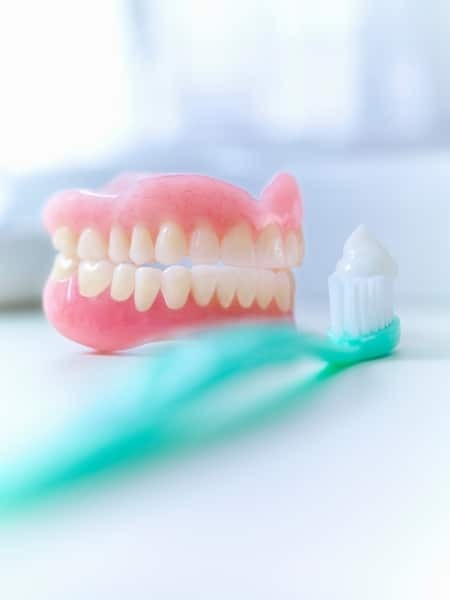 Of course, it is important to keep your new dentures in top condition so that they can give you years of service, just as you would with your own teeth. If you follow these 5 simple tips, you shouldn’t have any problems. Wearing your dentures 24/7 can lead to tongue and denture plaque, gum inflammation and fungal infection – it’s not good for all-round oral health. Your gums and other denture-bearing tissues need a chance to rest and recover overnight, while benefitting from exposure to antibacterial agents present in your saliva. So give yourself a break and remove your dentures every night when, after all, they won’t be needed. Simply place them in a glass of warm water or a proprietary alkaline-peroxide based solution for 6-8 hours or overnight. You can use half water, half vinegar if there are no metal clasps. Just like your natural teeth, dentures are susceptible to a build-up of tartar and stain, resulting in bacterial exposure, and need to be cleaned regularly. Your gums can also become irritated and infected. You should brush your dentures at least once a day with a soft toothbrush or denture brush. Denture can be cleaned with a mildly abrasive toothpaste or hand soap, liquid antibacterial soap or denture cleanser. 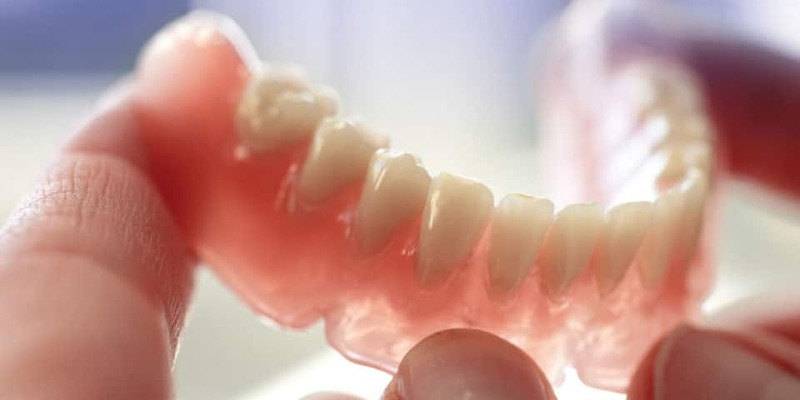 Treat your dentures with care – they are delicate as well as expensive, so don’t just leave them lying around. When you clean your dentures, it is advisable to hold them in a folded flannel or hand towel for protection and to stop them from slipping out of your hand and falling to the floor. Make sure your toothbrush is soft enough to clean effectively without being too rough so as to damage your dentures. Taking care of your dentures is one thing, but looking after your gums and mouth is just as important. Every time you remove your dentures (e.g. after every meal and at night), make sure you rinse your mouth with water before you put them back in. It is also advisable to give your gums and tongue some attention every day by scrubbing with a soft brush, preferably before and after you use your dentures. With partial dentures, you have twice the work: brushing and flossing you natural teeth as well as cleaning your dentures. Keep a close eye on your dentures: Are they comfortable? Do they fit properly? Is there rubbing, soreness or pain? If any of these apply, a visit to the dentist may be necessary. Poorly fitting dentures can cause a host of problems that can be avoided with the help or your dentist who can make the necessary adjustments. Your mouth can change as part of the normal ageing process, and sometimes poorly fitting dentures or pain can be a sign of mouth disease, which your dentist will be able to deal with. In either case, make an appointment and get it dealt with, for your own comfort and peace of mind. This article was provided by Sara Bryant, working with Dental Healthcare Practice who were consulted over the content and who strive to improve denture care.